Eric W. K. Tsang received his Ph.D. from the University of Cambridge. Before joining academia, he worked as corporate banker at HSBC in Hong Kong. He is the Dallas World Salute Distinguished Professor of Global Strategy at the Jindal School of Management, University of Texas at Dallas. He previously held faculty positions at Nanyang Technological University in Singapore and Wayne State University in Detroit, and was an honorary professor at Sun Yat-sen University in China. Dr. Tsang’s main research interests include foreign direct investment, strategic alliances, organizational learning, entrepreneurship, and philosophical analysis of methodological issues. He has published in top-tiered business journals, such as Academy of Management Journal, Academy of Management Review, Journal of International Business Studies, MIS Quarterly, Marketing Science, and Strategic Management Journal. He has served on the editorial boards of most major IB journals − Journal of International Business Studies, Journal of International Management, Journal of World Business and Management International Review − in addition to other management journals. 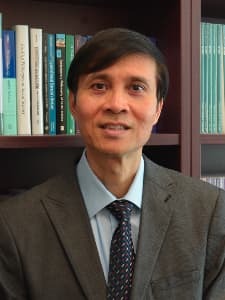 Besides being an IB researcher, Dr. Tsang is a leading scholar in applying philosophy to solve methodological problems related to assumption, explanation, generalization, ontology, replication, and theory testing. Some of these research results were included in his book The Philosophy of Management Research (Routledge, 2017). His sole-authored article “Case Studies and Generalization in Information Systems Research: A Critical Realist Perspective” won the 2014 best paper award conferred by the Journal of Strategic Information Systems. His 2016 Academy of Management Review article “A Realist Perspective of Entrepreneurship: Opportunities as Propensities” (with Stratos Ramoglou) has contributed to the heated debate about the ontological nature of entrepreneurial opportunities. Dr. Tsang’s publications have been well cited by fellow researchers and have made significant contributions to the IB and other literatures. For example, his article “Social Capital, Networks, and Knowledge Transfer” (with Andrew Inkpen) won the 2015 Academy of Management Review Decade Award.